I used muslin. It's a cream/tea stained color. It was really easy to glue down. I used white glue. Then I painted a little matching pillow with a nest. And done! 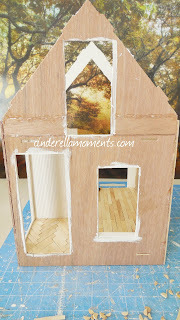 Now onto the Baleine Beach Cottage dollhouse! After I decided on the design, I cut out the house and glued it together. I plastered the interior. 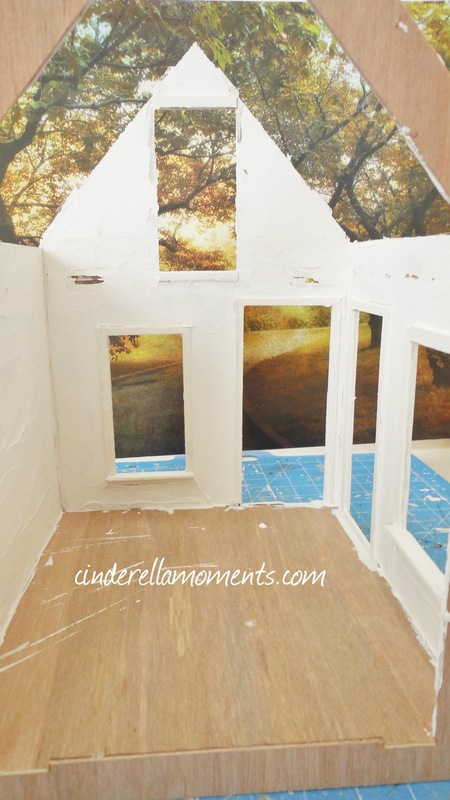 Sanded down all the walls until they were pretty smooth. I added a wall to make a separate entry. My wood floor is done. I used Popsicle/craft sticks. 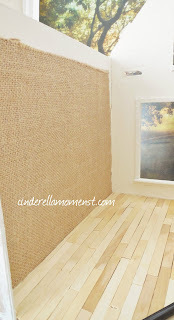 This wall is burlap. I found this piece of burlap in the scrapbook section of the store. It's not too bulky. This wallpaper has branches and birds on a blue/green background. I just saved the image from the internet and printed it out. The exterior is nothing special yet. But my little entry has beadboard (also from the scrapbook department) and herringbone pattern wood floor. Thanks for joining me today! 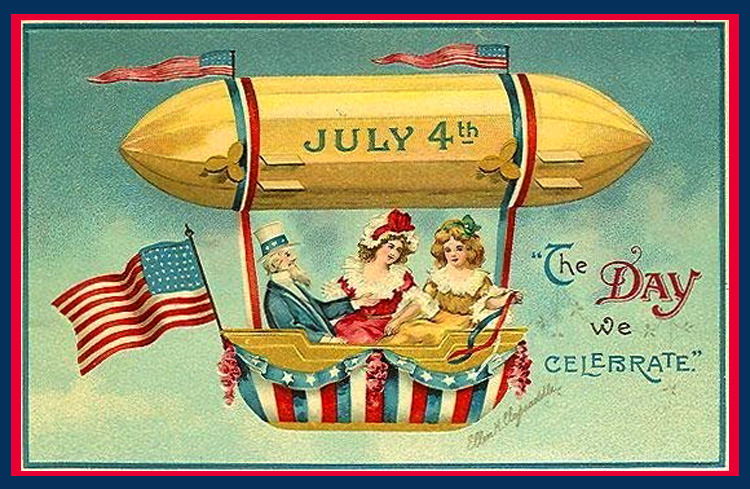 I hope those of you in the USA have a very happy and safe Independence Day! Love the chair! It's darling, and you made it sound so easy that I might give it a try myself. And the beach cottage is coming along nicely. The scrapbook section is a treasure trove for miniaturists! Beautiful chair! Happy Independence Day to you too! Hi Caroline! Thanks for sharing the link to tutorial, your armchair is beautiful! 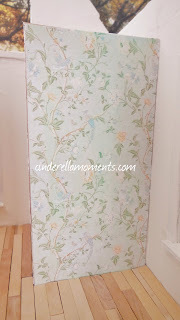 I was blown away with the wallpaper you choose, it is gorgeous. Hi Caroline! The chair is so pretty and thank you so much for the link. The house is looking really good and I love your choice of wallpaper! I hope you have a nice 4th of July holiday! I love the chair and the beautiful wallpaper. El sillón es perfecto,con ese "aire" antiguo,desde luego has logrado el efecto que buscabas,muchas gracias por el enlace!!! La casa tiene una preciosa estructura,la idea de la entrada independiente,me gusta mucho,estoy deseando ver los avances!!! The chair looks great, as does the lovely next cushion. Perfect for a cottage. Also love the wallpaper. I love your chair, it is super cute and the pad with your logo so beautiful. Thumbs up. I will check the link. I wish you a wonderful Independence Day! 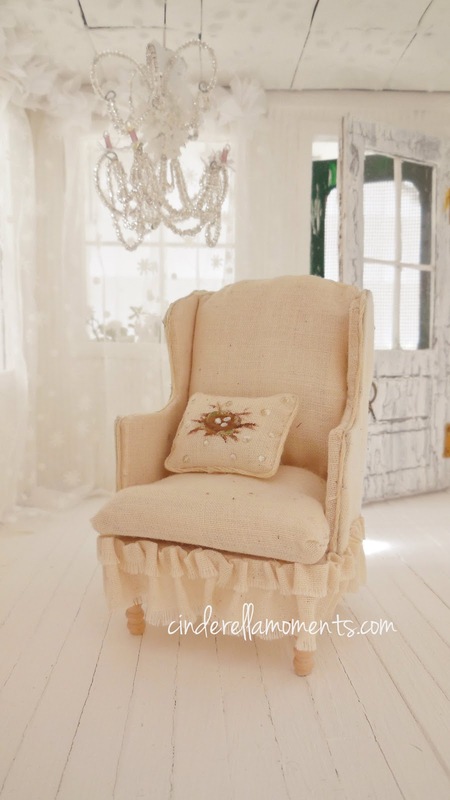 Love the little chair! Will check out the link. 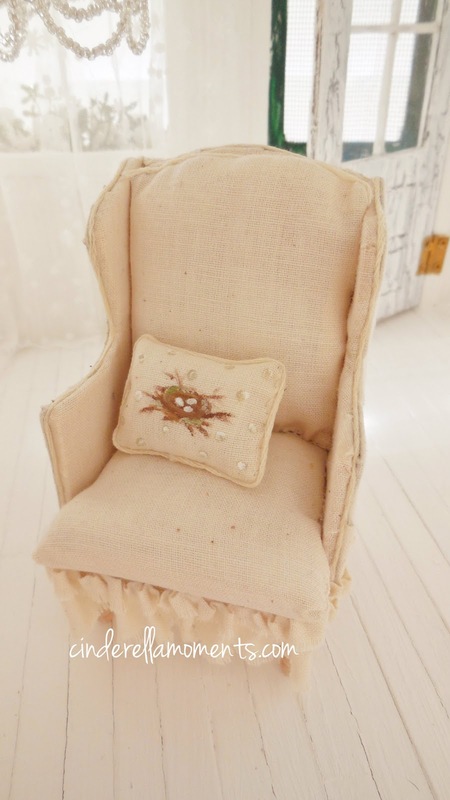 I love what you did with the chair and pillow, and thank you so much for the link. The house is looking very sweet already. I love the chair!! The fabric and style are just perfect. The beach cottage looks wonderful; I like the wallpaper. Your chair is amazing, simple and chic. Un sillón perfecto y muy elegante para tener un rato de descanso. Really love the chair !!! Want to wish you a great summer. Hi Caroline! 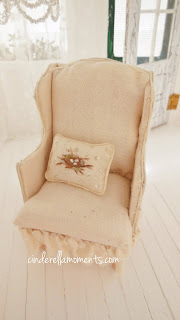 Your chair is wonderful and who knew that House of Miniatures would have a set of patterns to download!??? I always liked their furniture kits and the fact that you can build your own using their templates is Fantastic! You have chosen wonderful upholstery fabric and the color is totally in keeping with the theme of the house plus your chair looks to be very comfortable. ( It just needs a good book!) Your beach cottage is so airy and light as a feather! Everything about it is reminiscent of sand and sea and sky! Wish I was there. Your chair is beautiful. I am sure this cottage will be another stunning creation. Hi Caroline, you have been busy on a new beach house, it looks great so far! Love your wooden floors and that chair is just divine, beautiful :D! Thanks for sharing the link, I'll go and see. I like your idea to make a separate entry, it looks so cozy, and I can´t wait to see what you´re gonna do with the outside off beach cottage !! 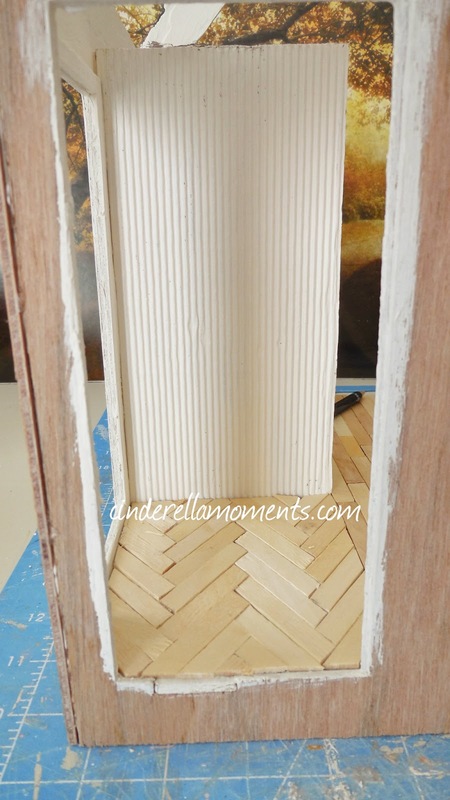 Love the herringbone floor! Looks time consuming... but well worth the effort! The floral wallpaper is just perfect as well. And the chair!!! Goodness... it's gorgeous! Do you sew or just glue the entire thing? 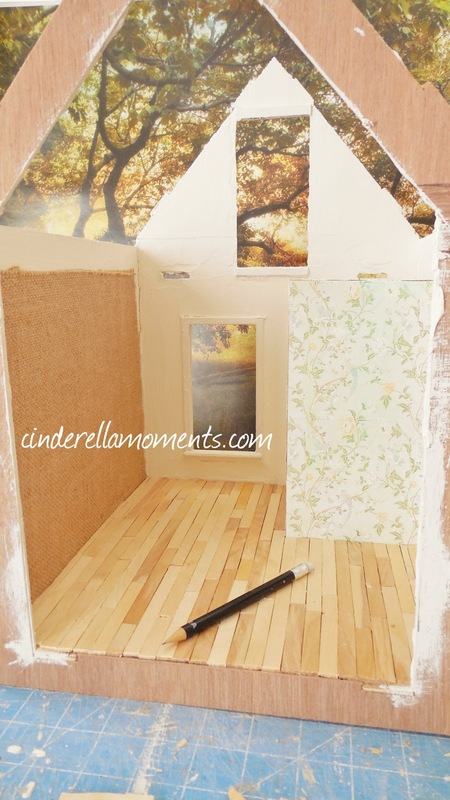 tell this is gonna be another darling doll house. Love the chair you made, you did a beautiful job on it, and the house is really coming along, can't wait to see the finished product. Does anyone other than hobby lobby sell the spindles? You'll have to look online then. Miniatures.com sells many different types. Look in the stairs & railings section. Or try Ebay.